As originally laid out, there are three electric baths, separated by a corridor from the Turkish bath itself. This would enable passengers to have an electric bath without any need to enter the Turkish suite. The three hot rooms comprising cooling-room (frigidarium), temperate room (tepidarium), and hot room (laconicum) are arranged so that there are two doors between the hot room and the plunge pool, with its circular needle shower. The thermo tank, placed as close as possible to the hottest room, contained coils of steam-filled pipes over which air is blown to heat it on its way through the hot rooms. This plan is from a colour brochure with foldouts published in 1931. It was designed to advertise cruises on the White Star Line's Adriatic and its newer liner, the Britannica. 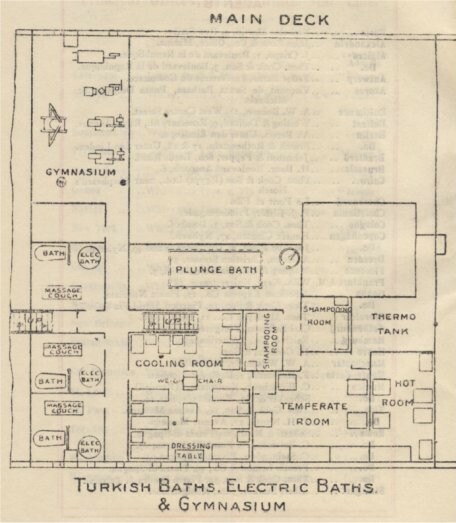 The plan shows how the Adriatic's Turkish baths looked after the 1928 refit. 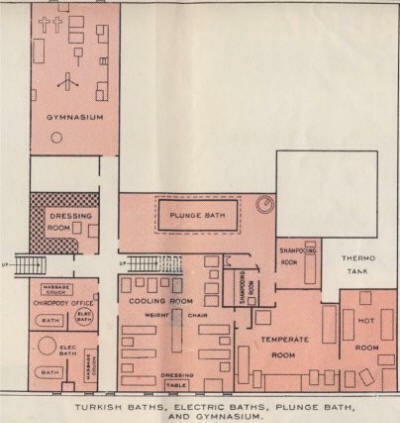 The main changes were: (a) the replacement of one of the electric bath rooms by a dressing room, and (not labelled on the plan) a room for the two Turkish bath attendants; (b) the shared use of another electric bath room with a chiropodist; and (c) the addition of privacy curtains round some of the couches. Otherwise, apart from the rather more sophisticated weighing chair and a larger dressing table, all that can be detected are a few minor re-arrangements of the furniture.